Struggling national carrier Air Zimbabwe left its passengers stranded in Johannesburg on Tuesday night - by flying out four hours early. 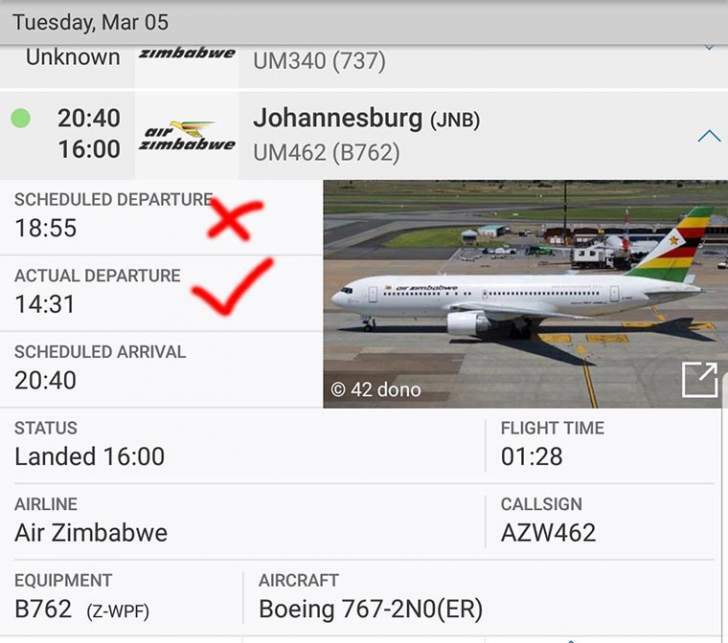 Flight UM462 was not due to depart OR Tambo International Airport until 6.55PM - but it took off at 2.31PM and landed in Harare at 4PM. It had not been expected to arrive until 8.40PM. Among the stranded passengers was the former MP James Maridadi. Another passenger, who asked not to be named, told ZimLive: "There was no communication from Air Zimbabwe. We turned up and were told at the check-in counter that our plane left at 2PM. It was one of the most shocking things I’ve ever heard because you assume planes have a schedule they stick to, not behave like kombis which are on their way once they’re full." The stranded passengers were put on a Fastjet flight that was flying out later in the evening, the passenger added. A spokesman for Air Zimbabwe has not responded to a request for comment. Data from the airline tracking website, Flight Radar, shows that the same plane later flew to the Tanzanian capital Dar-es-Salaam at 9.21PM on a scheduled service. 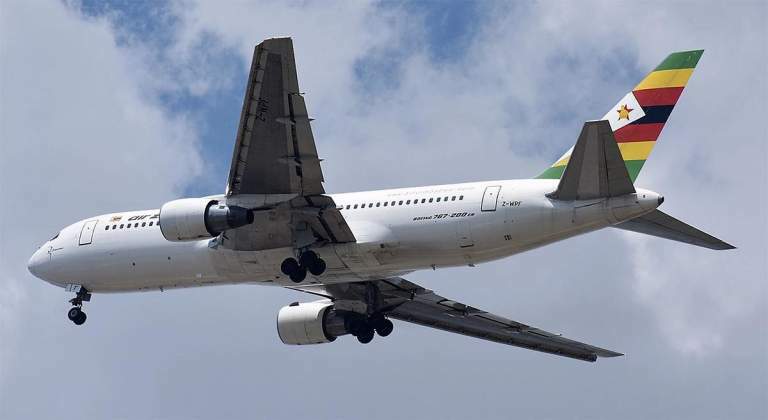 ZimLive understands Air Zimbabwe, after years of mismanagement, is now down to its last aircraft - a Boeing 767 (Z-WPF). A Boeing 737, the only other viable aircraft in the airline’s fleet, is grounded and due to undergo a D-Check, also known as "heavy maintenance visit" - the most comprehensive check for an airplane which must be undertaken at least once every 10 years. For a D-Check, which takes two months to complete, engineers take the entire airplane apart for inspection and overhaul. Even the paint may need to be completely removed for further inspection on the fuselage metal skin. But Air Zimbabwe managers are baulking at the cost of the D-Check which on average costs $2,5 million rising to US$4 million depending on fixes that need to be carried out. "Considering the age of the airplane, the state of the company’s finances and the cost of the D-Check, a decision is close to being made that the plane be retired or sold on," an airline executive said, declining to be named. Air Zimbabwe expects to take delivery of an Embraer ERJ145 acquired from the United States this month, and the airline will add two Boeing 777s acquired by the government from Malaysian Airlines imminently. Air Zimbabwe has a debt of almost US$330 million and the government has failed to attract investors to keep it afloat. Ministers then came up with a secret plan to set up Zimbabwe Airways as a debt-free surrogate of Air Zimbabwe, with a plan to eventually shut down Air Zimbabwe. Zimbabwe Airways now appears stillborn and the aircraft it had secured will now be given to Air Zimbabwe. Air Zimbabwe hopes to revive its Harare-London and Harare-Beijing routes once it takes delivery of the Boeing 777s, but airline executives say the capacity to put the two planes in the air immediately is still limited, and they may be forced to lease out one of the airplanes while building their own capacity which includes paying creditors in London.